So simple, so compelling. Further, it points us to the two great themes that dominate this tale – that of love and that of war. Far from being a lightweight interstellar shoot ‘em up, Old Man’s War has the heart and brain of a modern classic. It’s not just a good read – it’s a great one. In Scalzi’s futuristic world, the good news is that mankind finally made it into interstellar space. The bad news is that planets suitable for human habitation are few – and our claim to those few is violently challenged by other alien races. So we hit back: for the sake of the old world, Earth, and for the sake of new ones. This war has been going on for decades, and signs of a reprieve are nowhere to be seen. Back on Earth itself, most of our resources are in the hands of the CDF (Colonial Defense Force). Once you reach retirement age, you can join up with the CDF. Youngsters aren’t wanted; people who carry a lifetime worth of experience are. If you sign up, you’ll be whisked off Earth and never permitted to return. You’ll serve at least two years on the front. If you survive, you’ll be given a homestead of your own, on one of the newly colonized planets you helped fight for. If you survive. … who wants to kill some aliens? While casting about for a punchy way to describe this book, the first thing that sprang to mind was a comparison to Pixar’s UP. No joke. Think about it. In UP, the elderly Carl Fredericksen mourns the death of his beloved wife, Ellie, and thereafter embarks on an adventure. In Old Man’s War, John Perry (also elderly and also a widower) sets out on his own adventure in the aftermath of his wife’s passing. Obviously, we’re talking about two different kinds of adventuring here – rescuing exotic birds vs. blowing away alien beasties – but the situational similarity is neat to consider, amiright? Lovers of military sci-fi, take note: Old Man’s War is a ripping yarn that pays homage to the likes of Starship Troopers and The Forever War. This isn’t to say it’s a recycling of those works (quite the contrary), but the influence is clear. What raises this story above many of its peers is the deeply human element. 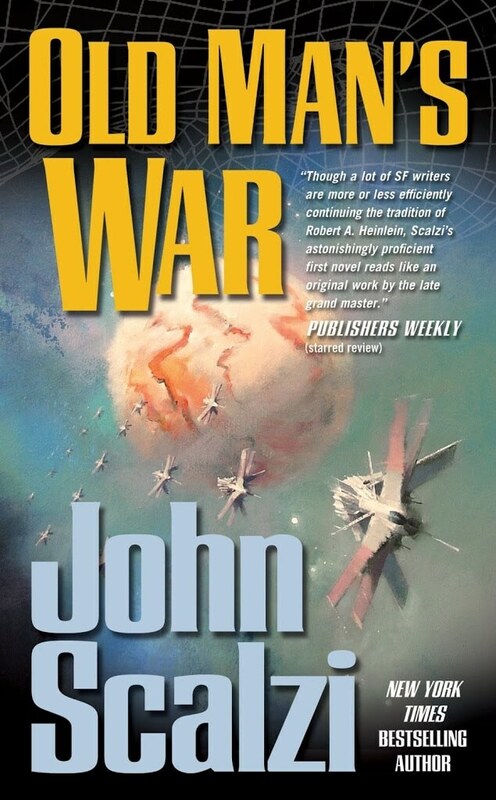 The soldiers here aren’t just so much cannon-fodder, and Scalzi refuses to let the action – as thrilling as it is – get in the way of good old fashioned character development. This is what I call a triumph. Oh, and Santa – if you’re reading this, pay real close attention to this next bit: I want a CDF MP-35 for Christmas. Seriously. Get me one, and I’ll let you live. The other books in this series, including the 2013 Human Division, are also worth reading. You’ll appreciate where the adventure eventually goes. Scalzi has an active movie deal for OMW, so hopefully in a couple years non-readers will enjoy the story too.